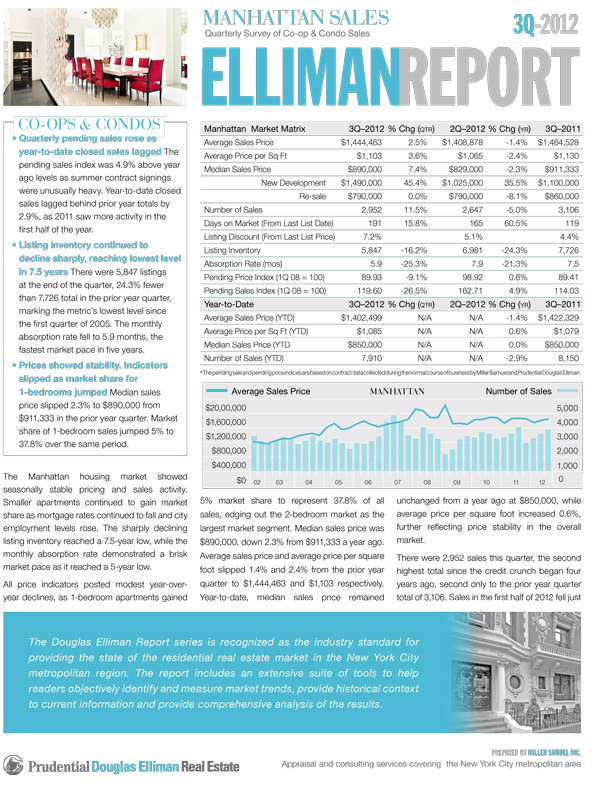 We published our report on Manhattan market sales for 3Q 2012 this morning. I’ve been writing them for Douglas Elliman since 1994. -Closed sales slipped 5% from last year but pendings jumped 4.9% ahead of last summer – 2011 had more written business in first half of year while 2012 had more momentum going through summer. -Inventory fell 24.3% from last year to lowest level in 7.5 years. Low equity keeping many sellers from listing (those sellers can’t become buyers because of tight credit), election year paralysis and concern about direction of economy, Europe, Federal Reserve’s QE3. -Condo price trends outpacing co-op price trends likely due to foreign buyer demand. -Luxury market prices slipping as inventory edging higher – however there was a jump in 3-bedroom sales. -New development sales market share at 17.8%, consistent with past several years. -Manhattan remains one of the best housing markets in the US: employment rising, tight inventory and strong international demand – despite tight credit conditions. Updated charts and data tables will be uploaded later today. UPDATE: The charts and data tables are updated. Here’s the press coverage for the report today. Last fall Prudential Douglas Elliman turned 100 years old and they asked me to write an article for their Elliman magazine. If you’ve been living in a cave, I’ve been writing their housing market report series since 1994. What started as a simple project morphed into a fun, albeit gigantic, research project. I learned a lot about the evolution of the Manhattan housing market, largely through the amazing incredible New York Times archives. This was right about the time of my web site revision and semi-necessary hiatus so I am cleaning out my desk of posts I have been itching to write so please indulge me. The article I wrote for Douglas Elliman was beautifully presented by their marketing department and prominently inserted in their Elliman magazine (and iPad app!). Diane Cardwell of the New York Times in her “The Appraisal” (an incredible column name BTW) penned a great piece: In an Earlier Time of Boom and Bust, Rentals Also Gained Favor that originated from my article and zeroed in on the 1920s and 1930s to draw a comparison to the current market. Real estate media coverage in the first half of the century was social scene fodder (same as today) but with extensive and excessive personal details presented on tenants, buyers and sellers yet housing prices and rents were rarely presented in public. Manhattan made a rapid transition from single family to luxury apartment rentals and eventually co-ops. Housing prices and rents by mid century weren’t that much different than the beginning of the century. Manhattan’s population peaked at 2.3M around WWI. Wall Street in the 1920’s was seen as the driver of the real estate market. Federal and state credit fixes in the late 1930’s help bail out the housing market. Today I received a nice note from an economist at HUD saying they are using the market report series we prepare for Prudential Douglas Elliman in US Department of Housing and Urban Development’s US Housing Market Conditions site, specifically their annual Regional Activity summary. Using-our-market-reports-aside, its a pretty good overview of what happened in each region. Sort of reminds me of a Beige Book-like housing analysis. Not only that, but they provide access to a slew of data, research papers and reports as well as interactive maps that allow you to drill down to local levels. This isn’t a sales pitch so check it out. A primary concern with loan modification efforts is the seemingly high rate of recidivism. Within 6 months, more than one-half of all modified loans were 30 days or more delinquent and more than one-third were 60 days or more delinquent (OCC and OTS, 2008). Do these high rates of redefault imply that loan modifications are failing? I would say as currently structured – YES. The Obama administration has come up with a radically aggressive plan to reduce foreclosure activity which has remained alarmingly high. The key ingredient is to encourage lenders/services to allow more short sales – selling the home for less than the amount of the mortgage without going after the debtor for the shortfall. Mortgage modification plans have not been successful to date. The New York Times page 1 story today Program Will Pay Homeowners to Sell at a Loss does a masterful job in presenting the program and summarizing the problems of the issue to date, I just wish the title wasn’t so simplistic. Perhaps I am missing the point, but I feel like this solution has focused on the wrong side of the mortgage default equation. Are servicers going to forgive $200,000 in principal to get $1,000? Are homeowners going to move forward because they get $1,500 (more than the servicer) in relocation fees? The flood of short sale requests are already overloading many bank’s ability to handle the administration of this crisis – hard to see them able to manage the process any more efficiently. However, the only way out of this crisis is a solution with principal foregiveness in the equation or people will simply walk away and perhaps the servicer/lender ends up being hurt more. No easy answer I suppose. One mechanical aspect of this process which demonstrates the administration’s and government in general’s disconnect in the need for neutral analysis of value. Real estate agents, who are paid to sell property, determine the “reserve” price above which the lender/servicer must adhere to. How about a neutral party in the process? A qualified appraiser? (not the yahoos doing AMC work in high volume). I would assume the agents selecting the number are not allowed to sell the property (huge assumption on my part) but why not have someone who can’t ever sell the property, whose full time job it is to estimate market value, be assigned that task? In Bernanke’s speech to the American Economic Association on Sunday he suggested that it was regulatory failure, not keeping rates too low for too long, which caused the housing bubble. This seems to be splitting hairs, doesn’t it? Low rates triggered the housing bubble as money became cheap and easy to get. If the Fed hadn’t kept rates too low for too long, the bubble would not have happened. The regulatory system was ill prepared for the insanity that followed. House prices rose so fast that underwriting had to evaporate to keep the mortgage pipeline full. Regulators hadn’t seen this before and with the removal of Glass-Steagal and Laissez-Faire mindset, everyone in DC, including Congress and regulators, drank the Kool-aid. Mr. Bernanke has pointed to the Fed’s extraordinary efforts to stem the crisis, including the creation of new lending vehicles to banks and a reduction of bank-to-bank interest rates to virtually zero, as evidence that the Fed has a firm grasp of what the economy needs. The Fed’s handling of the crisis has been widely praised by economists. The Treasury and other government agencies already have supervisory power over parts of the financial system, but so, too, does the Federal Reserve. In his talk on Sunday, Mr. Bernanke acknowledged as much, rattling off a list of regulatory efforts the bank made to address nontraditional mortgages and poor underwriting practices. All regulators are human and subject to mob mentality just like politicians and consumers were. Everyone is awake now. That’s why I think a “bubble czar” type position is silly. I’m not blaming the Fed or Bernanke. Now about Greenspan…. In fact I think the Fed has done an excellent job keeping our financial system from the brink. Lets recognize Bernanke’s comments for what they are – dodging the minefield of Congressional approval. God help us if Congress is able to audit the Fed. Its not the audit I object to – its the politicalization of it. We need to keep the Fed neutral (in theory). A quick shout out to Sam Chandan at Real Estate Econometrics for his invite to me to speak to his MBA real estate class at Wharton last Monday. A lot of fun and no tomatoes thrown. Added bonus, they have Au Bon Pain as snack shop. The widely held belief that houses were used as ATM’s during the credit boom is a valid assumption given the massive withdrawal of home equity. Of course that parallels mortgage lending and as a result, housing activity boomed over the same period. With the post-Lehman credit crunch, millions of homeowners can’t refinance their mortgages or obtain a mortgage for a purchase. The contraction in credit has choked off the high pace of sales activity our economy has grown accustomed too. Yet sales and prices appear to be leveling off after a steady decline. Q: Who’s buying these homes? A: People that can actually afford and qualify for a mortgage. house values affect consumption by serving as collateral for households to borrow against to smooth their spending….house values, however, have little effect on the expenditures of households who do not need to borrow to finance their consumption. In other words, the segment of the consumer market that needs to borrow to spend, aren’t spending now. That doesn’t mean “no one is spending” – this is the cause for significant confusion in interpreting the health of our current economy. The results show that the consumption of households who need to borrow against their home equity increases by roughly 11 cents per $1.00 increase in their housing wealth. During the housing boom, the excess demand was simply fueled by those who had to excessively borrow to spend. It doesn’t mean that everyone had the same thinking. I’m thinking maybe credit isn’t going to lead us out of the recession. Banks are getting much enjoyment out of the wide spreads for now – gearing up for future carnage in commercial, auto loans, credit cards and industrial loans. This is apparent in the The October 2009 Senior Loan Officer Opinion Survey on Bank Lending Practices that was released on Friday. Its kind of the Beige Book equivalent of anecdotal credit practices. The report basically showed that fewer banks are tightening mortgage credit policy and mortgage demand is up. Of course this doesn’t mean much yet since bank lending policy can’t really can’t get much tighter. In the October survey, domestic banks indicated that they continued to tighten standards and terms over the past three months on all major types of loans to businesses and households. However, the net percentages of banks that tightened standards and terms for most loan categories continued to decline from the peaks reached late last year.2 The exceptions were prime residential mortgages and revolving home equity lines of credit, for which there were only small changes in the net fractions of banks that had tightened standards. About 25 percent of banks, on net, reported in the latest survey that they had tightened standards on prime residential real estate loans over the past three months. This figure is slightly higher than in the July survey but is still significantly below the peak of about 75 percent that was reported in July 2008. For the third consecutive quarter, banks reported that demand for prime residential real estate loans strengthened on net. About 30 percent of banks reported tightening standards on nontraditional mortgage loans, which represents a decline of about 15 percentage points in net tightening from the July survey. Only about 5 percent of domestic respondents, on net, reported weaker demand for nontraditional mortgages, the smallest net fraction reporting so since the survey began to include questions on the demand for nontraditional mortgages in April 2007. [Economic MetricWatch] How Do These Mean Housing Gets Better? The US economy is pretty weak right now. We need US housing to recover. We want housing to recover. Housing stats looked pretty darn nice this summer, didn’t they? But housing can’t get better all by itself. That’s why its pretty silly to simply watch housing price trends. Prices are a lagging indicator if there ever was one. Here’s a look at the four key economic indicators and their relationship to the housing economy – there’s a pattern here. At 3.5% 3Q 09 GDP, forecasters are saying the economy has gotten out of the recession. But this is really a thin metric – obviously fictional. Let’s start with the big picture. At the end of 2008, official GDP was -6.4%. This was also likely an understatement, but for the sake of argument let’s treat it as “fact”. Move ahead to the Q3 2009 reading of +3.5% and we see a swing of 10% in U.S. GDP – in merely the span of nine months. The only factor in the U.S. economy pushing against this massive contraction (and debt implosion) is the “Obama stimulus package”. However, using the Obama regime’s own numbers, less than $300 billion of true “stimulus” would reach the U.S. economy over the course of this entire year. Yet consumer spending fell 0.5%, the most since December 2008 so the recession is not necessarily over. With all the happy news surrounding this summer’s surge in home sales, its hard to imagine a housing recovery without jobs. In fact, unemployment is growing and even the broader definitions of unemployment are showing more deterioration. With the release of the jobs report on Friday, the broadest measure of unemployment and underemployment tracked by the Labor Department has reached its highest level in decades. If statistics went back so far, the measure would almost certainly be at its highest level since the Great Depression. In all, more than one out of every six workers — 17.5 percent — were unemployed or underemployed in October. The previous recorded high was 17.1 percent, in December 1982. The DJIA reached new highs for 2009. One of the key reasons for the housing surge has been the renewed (or simply improved) confidence by consumers in the financial system which began at the end of Q1 when the DJIA began its steady assent. It keep climbing. Perhaps its time to short the markets, or even housing? The Dow Jones Industrial Average (INDU 10,227, +203.67, +2.03%) rose 203.52 points, or 2%, to 10,226.64 — its best finish since Oct. 3, 2008 and the second 200-point gain in three trading days. The blue-chip measure has risen 4.7% over the four-day winning streak that began with the Federal Reserve’s policy statement last Wednesday, which quelled fears that the central bank might raise rates soon. Gold broke the $1,100 barrier as the dollar fell to $1.50 against the Euro. The G-20 summit didn’t show support for the dollar. Look for more foreign investment of residential real estate if this trend continues. Long term – housing doesn’t recover until the economy does. Comments Off on [Economic MetricWatch] How Do These Mean Housing Gets Better? [St. Louis Fed] Home Prices: A Case for Cautious Optimism? The St. Louis Fed, in their Economic Synopses publication contained a research piece called Home Prices: A Case for Cautious Optimism (Hat tip: Joe Weisenthal over at BusinessInsider) that does a great job lining up 3 housing related indexes and makes the case that we aren’t through yet despite positive month over month trends of the past 6 months. The title for this Fed research piece is simply wrong. It should be re-named: Home Prices: Not Much of a Case for Cautious Optimism. The chart shows the Case Shiller Home Price Index, FHFA Home Price Index and NAR Housing Affordability Index of Median Household Income presented in alignment. Here’s the problem with affordability as a measurement – it considers income, housing prices and interest rates but not the tightness of credit, which is THE story at the moment. The affordability index is significantly optimistic right now because of this gaping void over credit. Its great to have lower prices for all those buyers only if they can get a mortgage to take advantage of the opportunity. Mortgage underwriting is very tight right now and therefore we are looking at a 3 legged kitchen table that originally had 4 legs. Comments Off on [St. Louis Fed] Home Prices: A Case for Cautious Optimism?